I’ve missed only one QRCA conference. since I joined the organization in 1996. Since 1998, I’ve attended every annual conference. 2019 in Savannah will be no exception. So why do I keep on going year after year after year? I’m a big believer in professional development. I believe in the concept of education being a never-ending process — a lifelong endeavor. Before I became an independent QRC, I had worked for a large corporate marketing research supplier that firmly espoused the idea of continuing education. I was encouraged and paid to attend relevant conferences and other educational events each year. When I went independent, I wanted to continue that tradition, and I was easily able to do so through QRCA. Attending the QRCA conference is like getting a flu shot every year. Immersion in the conference experience (even as a passive listener) offers a form of protection. It reminds me of things I already know (but can easily forget), it allows me to learn about new techniques, and it exposes me to what’s looming on the horizon. And of course, the conference allows me to hob-nob (in-person!) with my peers — whether they are independents like me or are part of larger firms. That protective “shot” eventually wears off, so I make sure I get inoculated again by returning the next year. In my early conference-going years, I studied the program diligently to evaluate whether it was worth my while … whether I’d get anything out of attending that year’s conference. The listed program never came up short, so I always attended. Over the years, I stopped worrying about the program content, because I knew deep in my bones that I would come away with at least one new valuable insight about myself and my practice, or that I’d get a spark to pursue something that I’d never thought of before. It happens at every conference. The expense of attending has always been outweighed by what I returned home with. It’s a never-ending process. The learnings from a conference will enable me to climb a rung (or two! ), but once I’ve reached that rung, another one always comes into sight. So I am compelled to attend again and again and again. I also look at QRCA conference attendance as a reward to stay in the profession. Sure, some years are better than others. And in those down years, it seems like it may be an unaffordable luxury to attend. But even in those down years, I always find others in the same boat as me at the conference, and we support each other emotionally to carry on and continue. So, until I retire, I see myself attending every QRCA conference. For the inspiration. For the camaraderie. For helping me to be the best QRC I can be. 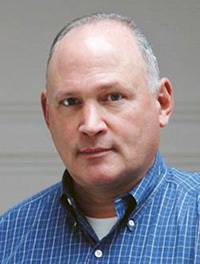 Jeff Walkowski is the principal of QualCore.com Inc., a consulting firm providing traditional and online qualitative research services to a wide range of industries including health care, financial services, automotive, and information services. He was schooled as a quantitative specialist and entered the industry in the 1980s as a statistician. He later discovered his talents as a moderator and evolved into a qualitative specialist by the mid-1990s. Design Thinking (DT) is a methodology that provides a solution-based approach to solving problems. It’s extremely useful in tackling complex problems that are ill-defined or unknown. This is accomplished by understanding the human needs involved, re-framing the problem in human-centric ways, creating multiple ideas in brainstorming sessions, and adopting a hands-on approach in prototyping and testing. The DT mindset is a natural fit with qualitative research. As Qualitative Researchers (QRs), we are experts at delivering customer experience-based insights. As a sister discipline, DT grapples with the conundrum of how to inspire design, stirring the pot enough to generate fresh new approaches. When QRs integrate DT processes into qualitative research, we reach whole new levels of insight generation. 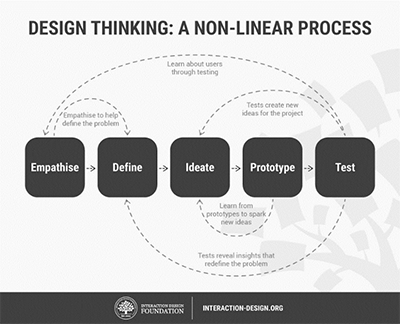 As a way of educating researchers on DT methodology – and its correlation to qualitative research – it’s helpful to focus on the five-stage Design Thinking model proposed by the Hasso-Plattner Institute of Design at Stanford University. In this phase the DT process aims to gain an empathic understanding of the issue or problem at hand. Empathy is crucial to a human-centered design process, and empathy allows design thinkers to set aside their own assumptions about the world in order to gain insight into consumer-users and their needs. Now you can put together the information you have created and gathered during the empathize stage. You will analyze your observations and synthesize them in order to define the core problems or issues you and your team have identified to this point – stated in a problem statement that is human-centered in nature. Now designers are ready to start generating ideas. You’ve grown to understand your users and their needs, and you’ve analyzed and synthesized your information to end up with a human-centered problem statement. With this solid background, you can start to ‘think outside the box’ to identify new solutions to the problem statement you’ve created, and you can start to look for alternative ways of viewing the problem. We are now in position to produce a number of inexpensive, scaled down versions of the product or specific features found within the product, so we can investigate the problem solutions generated in the previous stage. Prototypes may be shared and tested within the team itself, in other departments, or on a small group of people outside the design team. Designers or evaluators are now able to rigorously try out the complete product using the best solutions identified during the prototyping phase. This is the final stage of the five stage-model, but it is also an iterative process where the results generated during the testing phase are often used to redefine one or more problems and inform the understanding of the users, conditions of use, how people think, behave, and feel. In this phase, alterations and refinements can be made in order to rule out impractical problem solutions and deepen our understanding of the product and its users. Helping to support and foster creative potential within each person, honoring the leader and the learner in each individual. Bringing disparate voices and teams together, trying out all perspectives and viewpoints. Remaining curious and empathic about stories. Embracing inspiration and ‘gut feelings’ as an equal partner to analytical thinking. Opening doors to creatively imagining ideas, then pulling out all the stops in the search for new views, drawing on limitless possibilities. Not being afraid to fail, and, with this in mind, constantly experimenting in courageous, resourceful, and optimistic ways. As QR practitioners we must endeavor to be more thoughtful and deliberate about how we embrace the process of exploration. Insight and empathy are critical elements of both qualitative research and DT. The intention of both is to integrate visceral or empathic connections into the process of observing, exploring, coming up with new views, and then taking that next step into designing solutions. The goal is to trigger the imaginations of all involved. To do this, we can introduce an additional step into the qualitative phases of research in which we engage respondents in the process of designing prototypes, product ideation, or even strategic development.” We can infuse DT tools all the way through our work. The process is iterative, flexible and focused on collaboration between designers and users with an emphasis on bringing ideas to life based on how real users think, feel and behave. Now, doesn’t this thought capture the essence of what qualitative research is all about? Joe has served in corporate, agency and consulting roles as Director of Marketing and Research, Branding Strategist and Account Planning Director for companies like American Electric Power, Pan American, and Bates Worldwide. He was recognized with a Gold EFFIE, and holds a MBA in Marketing from the University of Connecticut. You can reach Joe on LinkedIn. Can your business pass the “unplugged” challenge? Years ago, many of us enjoyed listening to “unplugged” music events or recordings. But could we do the same with the technology that is a part of our daily lives and businesses? How long could you live in an “unplugged” society, for instance, without wireless and wired communications/data services and electricity? Is your business prepared to be “unplugged”? To gain a global perspective, fill out the following short survey by Thursday, May 17th 21:00 (Spain Time) and you could win the grand prize of a premium Puerto Rican coffee. I will be honest and say that I never thought of this question before two of nature’s ladies visited our island paradise and gave us the experience of “unplugged” living. On Friday, I will be sharing our experience from a qualitative perspective including insights from other QRCs, recruiters, facilities and marketing business firms in Puerto Rico. Valencia will be my 4th Worldwide Conference — I was strong-armed to apply to speak at the Prague conference, the start of my habit. After Budapest, I was a card-carrying member of the fan club. I began to actively recruit new addicts as co-chair of Vienna in 2016. It’s an escalating condition, as you can see. I’ll be feeding my addiction to great ideas, as well as great coffee, in Valencia. Here’s why. I’ve met great people at every event, and heard people speak that I have never heard speak before, and from all over the world. Speakers have to have a strong idea to make it onto the program – there are always too many applications for a limited number of spots. It always feels like the best and brightest to me, and a treat to be among them. Once you start going to global conferences, you will grow your global network. Eventually, you will know these people well enough that you really want to break bread with them from time to time. This conference has lots of talk time, and is a great place for connecting and reconnecting. Hence the addictive factor I mentioned, but I am a happy addict. The speakers really dish up their best stuff from a posture of sharing, contributing, and mutual learning. Do they simultaneously build their brand? No doubt about it. But I have found this event to be educational with no lingering sales aftertaste, and I love that. I am still thinking about a presentation about collective culture in India that I heard at least five years ago. At the same conference, there was a semiotics session about clouds that totally went over my head. I’m not kidding, I still know nothing about the semiotics of clouds. I’m hoping to fare better with the semiotics of toy soldiers from the same speaker this year. The speakers have always given me ample brain food, and I love that. Conversations at this event never start with “what session did you attend” because this is all plenary. Instead, you can walk up to people at the next table and dive right in, knowing they heard the same thing you did. Or maybe they didn’t… And therein is the start of a great conversation. There will be cava. And I’ll be enjoying it along with smart people I don’t get to see very often. Maybe you’ll be one them. Cheers! The photo was taken of the author and Ilka Kuhagen at a previous Worldwide Conference. Amye Parker is a 2018 QRCA Young Professionals Grant recipient. 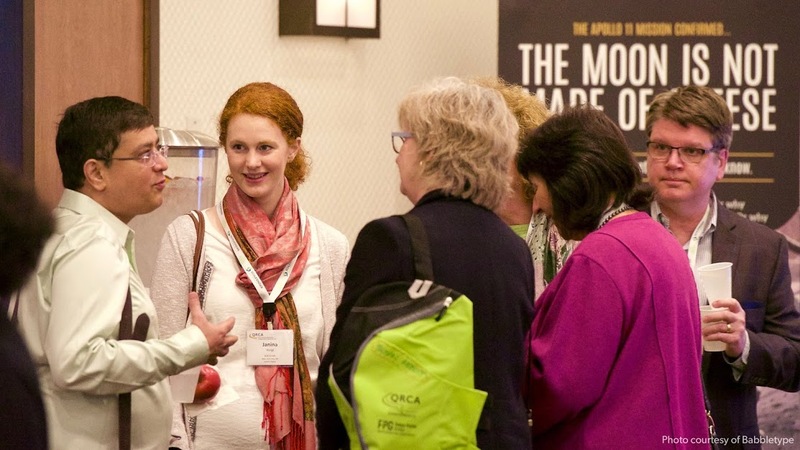 First launched in 2014, the Young Professionals Grant recognizes promising qualitative researchers aged 35 and younger with free passes to the QRCA’s Annual Conference. How should I prepare for Elevate & Cultivate? What would the conference involve? How would I avoid awkward networking situations? Every first-timer gets paired with a seasoned conference goer who helps prepare for the conference. I quickly received an email introducing me to my ‘ambassador’, Kate Wagenlander Watson. She sent me lots of tips, answered all my questions, and even met me at 8 am on the first day of the conference. Kate was genuinely invested in making sure I had a good time. The conference contained the perfect balance of big-thinking seminars, participatory round-table discussions, and practical frameworks with highly applicable tips. The biggest surprise I had was how collaborative everyone was. Despite theoretically being competitors, everyone was forthcoming in offering advice and best practices. Everyone at the conference was welcoming and several social events also helped me meet others. A ‘speed dating’ session for all 55 First-Timers and their ambassadors was a great way to connect with people quickly. The dinner sponsored by the YP SIG attracted 30+ young researchers, resulting in fun times with great people. I left Phoenix with new friends, and renewed excitement about research. Recruiting high-quality research participants is becoming harder due to overly targeted criteria and professional participants. Tony Gentes of The Palmerston Group demonstrated the value of using social media outlets like Instagram, Meetup.com and Tinder. Using these outlets, recruitment is based on behavioural data and participants are less saturated with research. Our research doesn’t exist in a vacuum, and our clients are inundated with information. Tamara Kenworthy of On Point Strategies showed the value of using secondary and quant data to complement qual in designing buyer personas. The Qually Award finalists also included expert insight in their proposals to complement consumer findings. By looking beyond our own primary research, we gain a holistic view, and can thus provide more strategic and nuanced insight. We hear from people how ‘easy’ moderation seems, but anyone who’s in the job knows better. Naomi Henderson of RIVA Market Research engaged us in a highly relatable keynote speech on this topic, revisiting fundamentals and sharing encouraging (and hilarious) anecdotes. The power of System 1 thinking was another hot topic, and there were many sessions on projective methods offering case studies on activities like personification, deprivation and visual sorting exercises. In our overly-stimulated, attention-starved society, we are researchers and entertainers. Qually Award winners Lauren McCrae and Nicole Aleong of Lux Insights stood out by injecting videos and personality into their pitch. Daniel Berkal of The Palmerston Group inspired us to look beyond our industry for inspiration to elevate our research. For example, could we emulate the high-energy fun experienced at amusement parks? Crafting research that people want to be part of allows participants to open up, researchers to gain richer insight, and clients to be more engaged in the research. Clients are time-strapped and attention-poor. Therefore, our research needs to work hard to find longevity. Jennifer Spainhour and Martha Gordon led a heavily attended session on analysis and report writing hacks full of practical tips. In his masterclass, Berkal advised on the importance of keeping output top-of-mind throughout research design to ensure you deliver compelling insights. As a socialising tool, video cannot be under-estimated – it’s quick, visual and immersive, which drives results more deeply into our clients’ minds. Cat’s out of the bag! I guess I can no longer pretend to be a Millennial. I’m just back from the 2018 QRCA annual conference (Qualitative Research Consultants Association) and I’m feeling inspired but also humbled with a touch of GenX insecurity. This was my fifth conference — yet I’ve never felt this way before. Five years ago, the majority of attendees seemed like seasoned veterans and you could count the number of individuals under 35 years of age on two hands. This year, perhaps due to a great initiative from the QRCA to include young people via the Young Professionals Grant, there were many younger people (aka Millennials) in attendance. Their youthful presence was exciting and also a reassurance that our profession will continue to grow and thrive. However, part way through the conference, it dawned on me that I was the middle child. I was sandwiched between two great generations each making a significant mark on the qualitative research practice. Two fantastic speakers best brought this to life: Naomi Henderson is a qualitative guru who has practiced research since 1964, and Tory Gentes is an experiential researcher sure to become legendary in her own time. Naomi Henderson is an impressive bundle of energy and one of the greatest teachers of qualitative research. In fact, as a founder of RIVA, it’s possible she taught half of the people in attendance. The keynote speaker, Naomi presented on Moderating Effectively to Elicit, Identify and Report Meaningful Insights. She shared the skills of what it takes to be an effective moderator and, trust me, there are many. Pearls of wisdom like SQLA (Short Questions yield Long Answers), tips for avoiding leading stem questions, mirror your participants for the desired response, and don’t analyze while moderating. I was in awe of her wealth of knowledge and her ability to deconstruct her experiences in order to help elevate all of our skills as researchers. The title of Tory Gentes' presentation, 10 Tinder Dates in a Week? In a World of Social, Who Needs Traditional Recruiting Methods?, really illustrated how our practice is evolving. Tory, an Immersive Ethnographer at The Palmerston Group, is smart, vibrant, and courageous! She inspired me to think about using social media tools to help with/supplement recruiting or just to learn about your target audience before you interview them. Tory took us through a series of case studies where she used tools like Tinder, Couchsurfing, Meetup, and Uber to find and research her participants and their environments. I was impressed by her ingenuity and the authenticity of this approach. I also learned there’s a whole world beyond Instagram and Facebook and felt like I needed to dive back into social media and see what else had popped up since last I checked. Two generations: A pioneer and a trailblazer. One practicing longer than the other’s age. One representing the classic method our practice stems from and the other evolving it for the future. I’m squeezed by greatness on both sides, swinging between both worlds. On the bright side, I’m lucky to be learning from both. It’s an exciting time for qualitative research! As consumers, employees, students, and Fitbit-wearing human beings, we are being provided with more and more information every day about ourselves and how we benchmark against others—seemingly to no avail. We all know why: Data alone is never enough. But I have been obsessing about how data, in combination with an individual’s own interpretation of, or story about, that data, has the potential to unlock significant personal growth and societal change. Let’s take the state of education in the United States, which continues to decline despite measurement of every kind. These days, there is particular panic about kids needing to develop the hard skills that will be needed to prepare them for the jobs and technology of the future, as well as the soft skills, like problem solving and leadership, that often depend on self-awareness and confidence. A friend of mine who is a local elementary school principal sees a solution to these challenges in not only sharing students’ data with them, but in asking them to explain it, also. Knowing that students often learn best when they can relate a topic to their own experiences (known as constructivist learning theory), what kind of self-actualization could come from learning about themselves by relating their own data to their experiences? Rather than sharing discrete data points with students—test scores, attendance and awards numbers, detention and extra-curricular engagement statistics—what if we present these data back to students in a visual, time-series format and asked them to describe their journeys? How would they tell their story, and what could we learn that the data simply can’t say? What was happening at home, for example, or with friends, with teachers, with their health? Imagine if we could aggregate that unstructured data into actionable, system-wide insights—with benchmarks! Consider the case of one boy (we'll call him Danny) at my friend's school, whose data was showing fantastic performance in his words-per-minute reading score. It wasn't until reviewing Danny's results with him that she learned he was developing a speech impediment–which was bad for Danny and producing a misleading measurement. In a powerful testament to asking kids about their view of benchmarks, as well, Danny was shown different types of stuttering and immediately identified his own. He covers his stuttering by avoiding the "Sh" sound, which he can say correctly, but it makes him anxious. He was able to articulate all of this which, the principal noted, was "pretty amazing." She added: "He is now enrolled in speech and his reading is much better." So, we all know that data can’t tell us everything we need, but we don’t all appreciate how it can be used to trigger memories or sharing that can, in collaboration with the person whom the data represents, fill in a much more complete story. This idea of “numbers and narratives” holds equivalent power in the healthcare arena. What happens when we show patients a visualization of all their touchpoints with doctors, pharmacists, and facilities over the past ten years? What will they remember? How will they fill in the blanks? And how can these insights start to solve some of the biggest challenges facing healthcare today?